We are excited to present a week long class in beginning Navajo Weaving during the week of August 8 – 12, 2016. 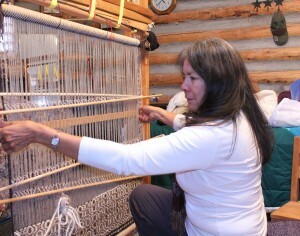 Those who participate will be taught the process of weaving a Navajo rug from start to finish on an upright Navajo loom. Spinning and plying the edge cords before warping will be part of the class. Students will compose their own design and choose their own color combinations. The Beginning Navajo Weaving Class will be taught by Ilene Naegle. Ilene was brought up in Ganado, Arizona and learned to weave from her mother, Ella Mae (Naegle) Kay. Ella Mae taught weaving in Sedona along with Mary Pendleton, who wrote Navajo and Hopi Weaving Techniques, published in 1974. It is still a wonderful resource today. Ilene continues to live in Ganado and teaches weaving at Dine College. She teaches weaving because she believes that weaving is a therapeutic practice and a way of discipline and self-control to strengthen the mind. Warp and weft yarns, battens, combs and spindles will be provided. Looms with dowels sticks will also be provided. Looms and tools will be available for purchase. These looms will produce a rug approximately 14 x 20. Lunches will be provided by the ranch, and lodging is available. This class is intended to be a small, intimate class. Only 5 – 7 students will be able to participate. We have a guesthouse at DeGoatsnsheep that sleeps a maximum of 4: there are two twin beds in the loft and a queen bed in the bedroom. It has a propane forced air furnace and is very well insulated. The guesthouse has a screened in porch, full bath, full and well-equipped kitchen, and small living room. It is normally listed through the Durango Chamber of Commerce, VRBO, and at our own website: www.degoatsnsheepranch.com. There are a few pictures of the interior and exterior on our website. If you are interested in reserving a space in the guesthouse and sharing with other workshop participants during this week, please email or call Linda and Jim Smith. (Also direct general questions about the workshop to this number). For those staying in Durango: DeGoatnshseep Ranch is located 18 miles from Durango on a well maintained county road. Access to the ranch with a regular vehicle is possible; if renting a vehicle, 4wd recommended. August is generally a pleasant month here in southwestern Colorado. It can be hot and dry during the day and cool at night. It also can be rainy. Good shirtsleeve weather, but bring some warmer clothes as well. To reserve a space for the class, please call the number listed above first. If we have room for you, you will need to send a check along with this application for the full cost of the class. *We do not take credit cards!!! *Materials fees can be paid by check along with registration, or with check or cash at the time of the class. *Cancellations for a full refund will be accepted until May 31, 2016. Are there any food considerations we should know about regarding lunches? The 20th Annual Sheep is Life Celebration is coming together!